Welcome, all the colors of fall with us and the new Global Inspired line from Thirty-One Gifts. These new exotic prints know no boundaries! We're kicking off National Handbag Day with the chance to win two fabulous bags from the Global Inspired line plus two matching zippered pouches to store all your goodies in style! Mom To Grandma welcomes you to yet another shared giveaway! We are coming up to the Holiday Season so think yourself and stocking your gift closet as you enter the exciting sweepstakes. Good Luck All! About Thirty-One Empowering women to succeed Thirty-One Gifts is also a woman-owned company! Their products are sold through a network of local sales consultants via their websites or home parties. Want to join the team? You can get started today! Visit Thirty-One Gifts to learn more about saving on products and earning income by joining as a consultant. Enter the Giveaway! 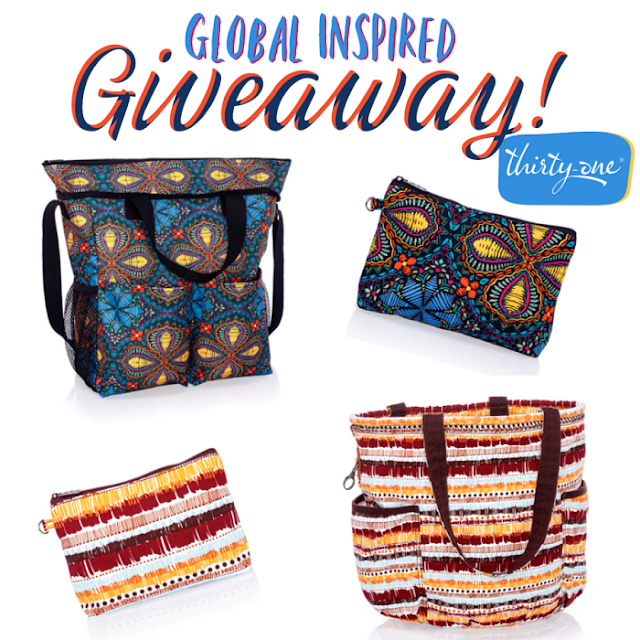 One lucky entrant will be selected on the entry form to win the Thirty-One Global Inspired Prize Package! Includes: (1)Retro Metro Bag, (1) Cross Body Organizing Tote, (2) Mini Zippered Pouches (ARV $120) Open for entry US, 18 years and older from 10/10/18 at 12:01 a.m. ET thru 10/31/18 at 11:59 p.m. ET. No purchase necessary. Void where prohibited. The winner will have 24 hours to respond to notification email to claim their prize or a new winner will be selected. See Rafflecopter for official rules. The Mommy Island and participating bloggers are not responsible for prize fulfillment. Follow The Mommy Island on Facebook and Twitter then use the entry form to enter!